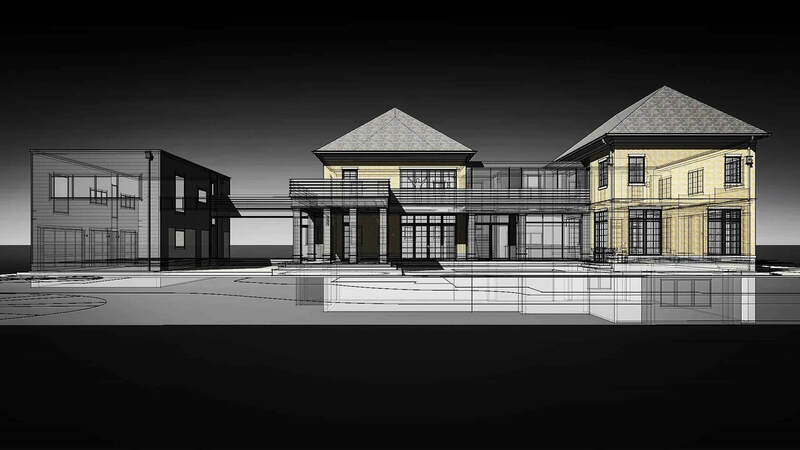 A new Modern Villa is in the works in the Old Northside neighborhood in Indianapolis at 1530 Broadway. We’re grateful to be working on this excellent opportunity with our clients, a builder-developer and physician with two young children. In fact, our client has been building homes for many years, most recently in Fall Creek Place. He has been working with other design firms on these projects. However, they decided for their own dream-home, they would engage a more comprehensive design process with HAUS. Their goal was to design something unlike anything they have seen in Indianapolis, historic or new. This was the beginning of a design concept which evolved to blend traditional and modern into one cohesive solution. We’ll be sharing more of the design development in the near future. Currently we are making some final design adjustments to the exterior in anticipation of IHPC-Indianapolis Historic Preservation Commission public hearing for final design approvals. Our initial design concept proposed three traditional building volumes joined with modern infill. Traditional, hipped-roof elements were inspired by French Provincial architecture, with either brick or limestone cladding. Modern components had flat roofs, minimal details, and metal or painted cladding. The traditional/modern mix included intersections and relationships that could resolve themselves in interesting ways inside-out. IHPC staff suggested that we downsize the accessory structure to be smaller in stature than primary structure. This was contrary to the essence of the original design concept. But our client was intrigued by the idea since it could be a way to also save on construction costs. We as architect were a little less eager to change the architectural concept. Initially we held-on to the notion that accessory structure technically is lower by a few feet. Besides, there are other examples on the Old Northside with larger accessory structures equal or larger in stature than primary. But we knew we had to explore a backup plan. This is because we appeared to be the only ones holding-on to the strict interpretation of the original diagram. In the interests of efficiency, our client asked that we make some quick adjustments for initial submission. This included cutting-off the carriage house hipped roof and adjusting cladding material from masonry to panel siding. At this time, we just kept the initial window pattern unchanged – a bit unresolved overall. We knew we needed to do more to resolve the adjustments to design concept. Accordingly, we looked forward to the opportunity to refine the architectural diagram and complete the design in due process. Perhaps upstairs windows should be 1′-0″ taller considering the traditional front elevation + building proportions (drop the sills). Provide details for the entry columns/fascia/railing and cornice (for clarity). Resolve final cladding material palette, particularly as it pertains to the modern rain-screen cladding details (including columns). Consider metal panel for the non-masonry, modern component cladding materials (fiber-cement panels may not be the answer). 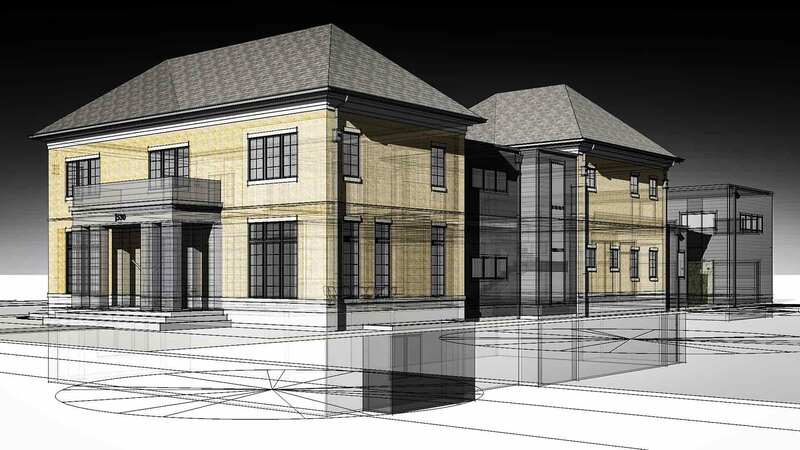 Complete the carriage house design + material palette/details. So, we were happy for the opportunity to re-engage and complete the design. 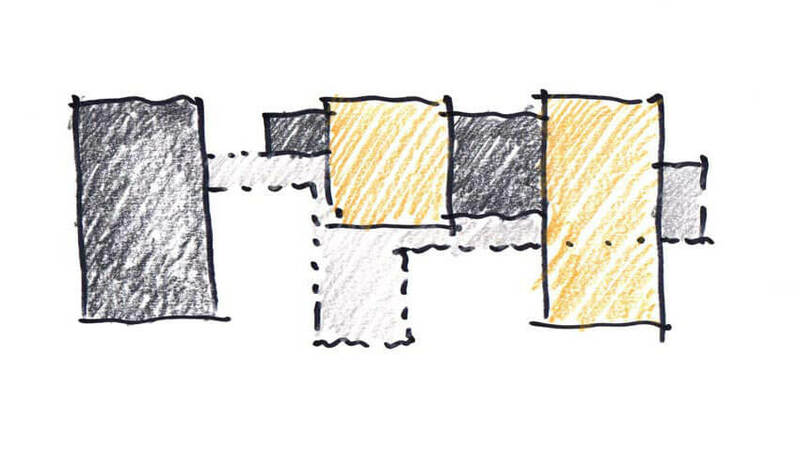 But first, we needed to modify the concept diagram to consider the carriage house as a modern component. Ironically, we were the last to buy-in to a more modern carriage house. Specifically, we still needed to resolve how it fit conceptually. It’s not as simple as cutting-off the hipped roof and changing the color. Traditional and modern window layout could and perhaps should be very different. And what about the resolution of materials? This needed to be a thoughtful solution, but simple. In the diagram above, we tweaked to a 3-color scheme from the previous 2-color diagram. Chiefly, we did this to maintain material and color contrast between loggia and carriage house. 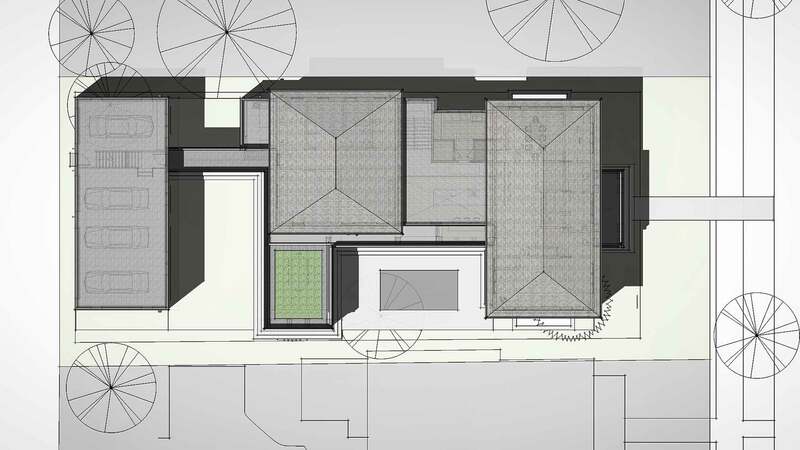 Carriage house to far left ties to the darker modern elements in material and form without changing the footprint. 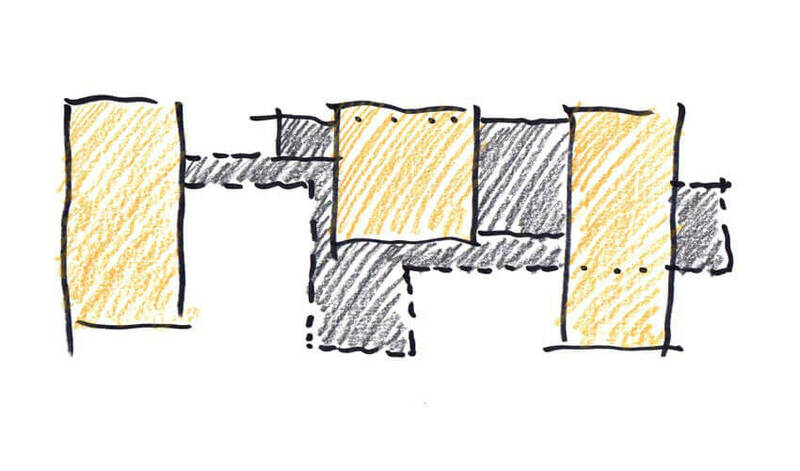 From here, we modify materials, openings, and details to resolve a logical and aesthetically pleasing composition. IHPC Commission voted to approve the project design on 02 January 2019. The only design suggestions pertained to limestone lintel thickness and hipped roof/cornice details on the traditional building components. Commissioner Jim Kienle suggested that the limestone lintel heights at windows/doors increase from 8″ to 10.25″. He also added that perhaps the hipped roof overhangs at tops of cornice could decrease a few inches. We agree that each of these two details could use a little more consideration/refinement. The question is specifically, what is our inspiration for the two traditional volumes? French Provincial style architecture has inspired our initial concept. We have not delved too deeply into the nuances of the style to this point beyond the basic concepts. However, advancing forward, we believe we can interpret the style with some degree of flexibility. And we agree that subtle variances may affect the feel and technical accuracy of the architecture. We are intrigued by all styles of architecture and the nuances and importance of DETAIL, whether historical or modern. The modern/traditional tension in this design will make for some interesting contrasts inside and out. Interiors are in-process. In fact, we are happy to report that our client has taken the modern-traditional concept and run with it. This includes the “story” of a historic home in ruins that they have taken, renovated, and woven together in a modern way. A good collaboration is in the works, and we look forward to sharing how the diagram helps resolve big-picture relationships inside-out. It’s in the details, folks! Please check-back as we will be adding more to the story as it unfolds!